Numismatics is the study of coins. The word comes from the Greek νόμισμα (nomisma) meaning ‘coin’. Collecting and studying coins has been a popular pastime, for those wealthy enough to have one, for many centuries. Even royalty, such as Queen Christina of Sweden (1626-1689), had numismatic collections. Coins can hold a fascination for people for any number of reasons – they are objects which have passed through the hands of many people over centuries; they show us images, at least ostensibly, of famous historical figures; lower denomination coins can be a rare connection to ordinary people of the past not noteworthy enough for chronicles and statues; coins can be beautiful; they can tell us about the formation and disintegration of economies; they can show the criminal activities of historical counterfeiters; or any number of more personal reasons. In the words at the top of this page, Philip Whitting – whose coin collection forms the backbone of the Barber’s coin collection – described what coins meant to him. A great many societies and cultures produced coins to service their economy. The Barber’s collection contains mainly Byzantine coins. The Byzantine Empire is what modern people call the Eastern Roman Empire after it had Christianised and its capital moved from Rome to Byzantium. For historians, the exact line between the Roman and Byzantine Empires is a complex issue. For numismatists it is simple: Byzantium began with the monetary reforms of Anastasius I (491-517) in 498. To the Byzantines themselves, however, they were Romans, Ῥωμαῖοι (Rhomaioi). This Roman identity is something reflected in their silver coinage from around 811. On the coin below, the inscription face reads: MIXAHL S θЄOFVLACTЄ ЄC θ’ bASILIS ROmAIOn. This translates as Michael and Theophylaktos, by God Emperors of the Romans, and refers to Michael I (811-813) and his son Theophylaktos. 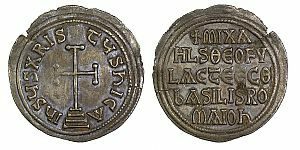 To learn more about coins or Byzantium, please follow one of the links to the right-hand side of this page.